Want to help us raise more money? 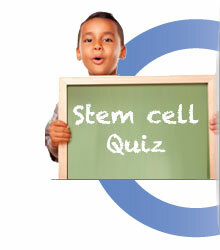 Once you have finished the Quiz, don't forget to share it with your friends! "As a parent of a child with diabetes, you always want to grab on to any kind of hope you possibly can." "Every family knows they are one phone call or one diagnosis away from needing what stem cell research can yield for us." "Stem cells serve as a sort of internal repair system..."
The American Academy of Pediatric Dentistry "recognizes the emerging field of regenerative medicine and encourages dentists to follow future evidence-based literature in order to educate patients about the collection, storage, viability, and use of dental stem cells..."
"...consider storing these precious dental stem cells that could one day be useful for a number of dental or medical applications." "It's not a guarantee, but if it can make a difference in our children's life down the road, that would be worth every penny." "She's going to lose her teeth anyway, so why not put them to good use?"